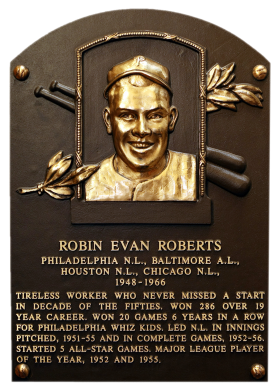 Despite a penchant for throwing the gopher ball, "Rockin' Robin" Roberts won 20 games for six consecutive seasons from 1950 to 1955. He topped the NL in wins four straight years, and in innings pitched and complete games five times each. 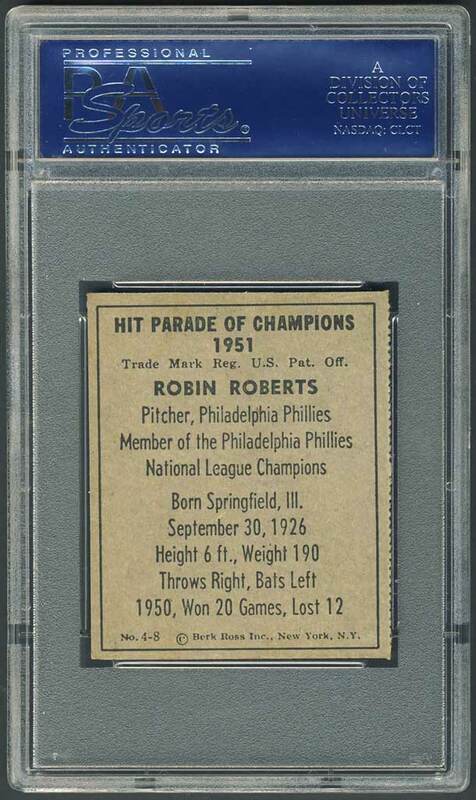 While not remembered as a strikeout artist, Roberts did lead the NL two years in a row in Ks. In 1952, he went 28-7 for the sixth-place Phillies. Roberts was 286-245 with a 3.41 ERA in 19 years. 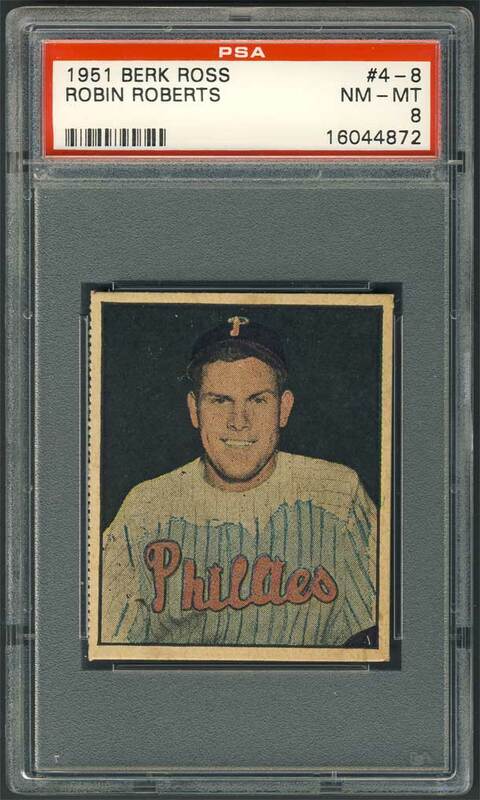 Comments: In October, 1999 I won a PSA 7 1952 Topps card on eBay. I've always loved this card, the yellow background. But, I settled on Eddie Mathews representing the '52 Topps set. So, this one had to be replaced. 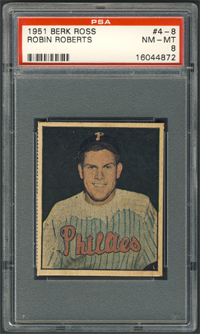 In December, 2007 I picked up a raw EX example of the 1951 Berk Ross card. I upgraded to a PSA 7 with another eBay purchase in March, 2008. And, in November, 2009 I upgraded to this PSA 8 with an eBay win from seller 4 Sharp Corners. Description: Entitled "Hit Parade of Champions", the 1951 Berk Ross set features 72 stars of various sports. The cards, which measure 2-1/16" X 2-1/2" and have tinted color photographs, were issued in four boxes containing two-card panels. The issue is divided into four subsets witht the first ten players of each series being baseball players. Only the baseball players are listed in the checklist that follows. 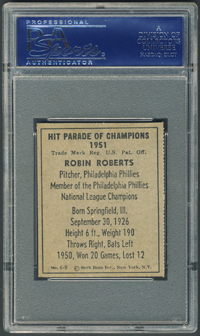 Complete panels are valued 50 percent higher than the sum of the individual cards.